Prometheus was wise and possessed the gift of great wisdom. But his brother Epimetheus was an idiot. He never planned ahead and spent his days in deep thought, brooding over the events of the past. But it was to this foolish Titan that the task of creating animal life fell. Epimetheus worked quickly and created many creatures of various forms to populate the lands and rivers, the mountains and the deep. Prometheus meanwhile dedicated himself to the creation of one creature, which would embody his vision of a complete animal, moulded in the shape of the Gods themselves. Prometheus created Man, and placed him upright on his hind legs so that he might look up toward the skies and the heavens to be inspired. Mankind, more than any other creature, most resembles the Gods. But his creation was little more than lifeless clay in this early stage. Prometheus turned to the Store of Gifts which the gods had given the brothers. In order to aid in the population of the earth, each of the gods contributed a gift, a power, and placed these gifts into a box to be divided up among all creatures so that each would have some ability with which to prosper. But when Prometheus turned his attention to the Box of Gifts, he found it empty. Thoughtless Epimetheus had doled out all the gifts in his haste and left nothing to prevent mankind from perishing as weak prey. The lion possessed great strength, the eagle great vision, the fox great cunning, the bear a thick coat, the wolf deadly instincts, the serpent poisonous venom, the cheetah great speed. Yet mankind had nothing to distinguish himself from the predatory beasts of the wild and the primeval forces of nature. Prometheus wept at the suffering of his creation and decided to champion the cause of mankind. He defied the command of Zeus, Lord of the Thunder-Bolt, and crept into heaven as the Gods were distracted. From the halls of Zeus he stole the heavenly flames, and fled to earth where he gifted man with mastery of fire. With fire, man made tools. With tools he made machines. With machines he sowed the land to grow the food for his belly. He built dwellings to isolate himself from the elements, from the scorching sun and the biting wind. He built walls around his settlements to protect himself from the wolves and bears and ravenous beasts. He built weapons with which to hunt and defend himself. He ate well and grew strong and he now had time to pursue the arts of wisdom. He developed science and philosophy and outgrew all other creatures in wits and wiles. Man became lord of all the plains. He took to the seas in mighty crafts of wood and iron, and spread far cross the earth. Because of the flame, civilization was born. Man ordered the chaos from the wild and made himself master of all beasts. Zeus was furious at the treason of Prometheus. He swore an oath to avenge himself upon mankind for the Titan’s betrayal before dealing out harsh punishment on Prometheus himself. Mankind's punishment was to be subtle. Zeus ordered Hephaestus the smith to craft a creature of such beauty, charm and elegance that it would rival the power of Man. The first Woman was born, Pandora. She was sent to earth to tempt Man with her beauty and to appeal to his senses. But she was to be the agent of the vengeance of Zeus. Before Pandora was sent to earth, the gods filled another box. Into this box they placed all of the wickedest evils that they could control, and they were glad to be rid of them. Into the box went famine, plague, pestilence, malice, greed, jealousy, hate, lust, paranoia and every other evil that haunts mankind to this day. Pandora unwittingly opened the box and delivered these evils into the world of Men. But well-meaning Hephaestus had tricked Zeus. His donation to mankind was hope. Out of the box sprang great evil, but there was also hope, without which we are doomed. As for Prometheus, his suffering was great. Mighty Zeus overpowered the Titan and chained him to a bleak mountain. He was doomed to suffer in his bonds as an enormous eagle would swoop down each day and devour the poor fellow’s liver. The pain was immense; enough to kill a mortal man, but Prometheus was of the immortal race of Kronos. Each night his liver would be grown anew, only to be eaten again the next day. His punishment was to be agonizing and eternal. Countless ages passed as Prometheus suffered for his great and noble gift to humankind, until eventually the Titan was forgotten. But he never repented. He suffered much, but would never apologize or beg mighty Zeus for freedom. His actions had been just and born of noble heart. His was the fate of one who had been punished unjustly by a tyrant, maddened by his own pride and power. He suffered so that mankind, his creation, might prosper. And he suffered in silence. Prometheus teaches us patience, courage, wisdom, resolve, strength, honour, defiance of tyranny and the love of wisdom and prosperity. Without the sacrifice of the Titan, man would have been at the mercy of the wild and the beasts which stalk it, savouring the taste of human meat. Ask yourself this, brothers: where would you be without Prometheus and his sacrifice? Strive to emulate Prometheus in his courage, defiance and commitment to strength and justice. "The most intelligent men, like the strongest, find their happiness where others would find only disaster: in the labyrinth, in being hard with themselves and with others, in effort; their delight is in self-mastery; in them asceticism becomes second nature, a necessity, an instinct. They regard a difficult task as a privilege; it is to them a recreation to play with burdens that would crush all others. "- Friedrich Nietzsche. Eventually it was Hercules (Herakles), a son of both Gods and Men, who unbound Prometheus from his chains. Hercules was the son of Zeus who atoned for the sins of his father by breaking the cycle of resentment and freeing the Titan from his imprisonment. But Hercules is not a god himself, he is a man. Neither a god nor a giant. Just a man. In this way, Mankind saves Prometheus in return for his own salvation, many eons past. This brings us to the title "Unchaining The Titan". It is a Promethean reference, true, but it is not solely a reference to Prometheus. The Titans were all chained down in the depths of Tartarus after the war between Titans and Gods. In Greek myth, the Titans represent the primal forces of nature. Wild and unruly. Animalistic and savage. They are as independent and ancient as the forces of nature themselves. The Titan is his own man, he bows before no-one and will defy the will of a tyrant to the point of death if necessary. He knows his own strength and loves his freedom more than his life. In Norse myth these concepts are represented by the Jotnar, the race of giants, enemies of Thor. And just as in the myths of the Norseman, the Gods of the Greeks, led by Zeus Thunderer sought to control the primitive forces of nature and imprison them where they would pose no threat. For the primeval giants are not to be trusted completely, as they are not all as benevolent as Prometheus. It was the thunderbolt, the first weapon of mass destruction, which allowed the gods to achieve this end. Mankind has prospered under the guidance of Promethean Fires. He has risen to the top of the food chain, and slaughters other animals at blinding speed. All of our civilization can be traced back to the gift of Prometheus, but man has taken this gift too far. We have removed ourselves from nature. We do not see ourselves as animal. We place ourselves on equal footing with the gods. We have forgotten the sting of the wind, the pangs of hunger, and the taste of blood. We have even forgotten the secret of fire, depending as we do on mechanical and chemical trickery to ignite a life-saving flame. Man has become over-civilized. We have forgotten the savage, primitive instincts which make up our being. We actively deny that we long for battle, for the hunt, for a war to wage and an enemy to slay. We see ourselves as being above these savageries. But we are descendants of Prometheus. The blood of the Titan race flows in our veins, though we might choose to suppress it. We might try to bind our Titanic nature in chains, but little will that profit a man. We are still half-savage. A little wildness in your diet is healthy. Some blood on your teeth is natural. The fire in your belly is what makes you feel alive. We have come far and gained much, but much has been lost. I am of the opinion that a few steps backward are what we need. I say we must reconnect with our animalistic instincts and our bestial urges if we are to be fully human. In life, balance is key. We must not neglect the beast in us for the sake of intellectual and technological progression. Likewise we must not waste the gifts of wisdom and imagination that Prometheus suffered so greatly to gift to us. We must balance the civilized with the savage, the intellect with the instinct, the foresight with the fang, the brain with the battleaxe. 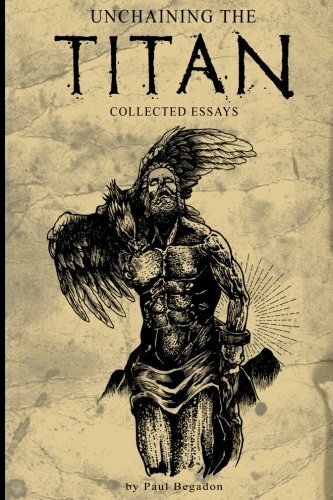 When we unchain the savage Titan we reconnect with our primitive ancestors whilst also maintaining the many benefits that thousands of years of civilization have brought us.